28 – 30th of October 2016: 7th Taragalte Festival date: Miracles really do happen! 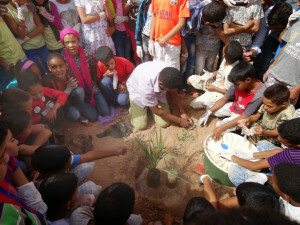 The Sahara Roots Foundation has been involved with helping create awareness of the fragile environment during the Taragalte Festivals since the 1st festival in 2009. We help with educational activities together with local schools as well as for visitors present and organise tree planting activities during the festival. “Taragalte” according to the historian Jacques-Miller, is the old name of the oasis of M’ hamid El Ghizlane as it is known today. In his work entitled “Le Maroc saharien des origines à 1670” he mentions that archaeology also gives interesting data: in the oases of Mhamid, there are the remains of ruins of an important fortified town known as “Qsbet el Aâlouj a well-known fortified town with the local traditions. It also appears to have to been identified with the kasba where the Saâidian Sultans had their own customs and their gold currency and where they struck their coins. This famous Saâidian kasba was located near the town of Taragale. Why the Taragalte Festivals in M’hamid El Ghizlane? The 1st Taragalte festival in 2009 was planned to coincide with the celebration of the 51e anniversary of the visit of the HM the late King Mohamed V to M’Hamid El Ghizlane in 1958. The Taragalte Sahara Culture Festivals are organized by two brothers, Halim and Ibrahim Sbaï. It was their father, Mohamed Chiekh Sbai and another members of the nomad tribes from the area, with whom the late King Mohamed V met. The knowledge and respect of the natural environment of the desert which have always been the way of life for the Nomads. The culture and music which have always included respect for this desert environment They are an expression of the ancestral way of lifestyle and it’s harmony with a durable lifestyle. The harmony in the poetry, songs, rhythm and dance that has its place in the apparent austerity of the desert! Poetry is important for the different Nomadic Tribes is often accompanied by music. It is obviously very important that these “stories” remain in alive. Music lyrics are especially about the respect for the desert and its inhabitants. The 1st Taragalte Festival would lead the way in keeping the “roots” of the traditional culture alive for the following generations to come. It gave the opportunity for all those present, from different organisations, to meet with each other and discuss different projects. It was an opportunity to interact with the inhabitants living in M’hamid, to enjoy the traditional music and the dances from this region. points of this festival. Together with my three children, Laurens, Wendelien and Richard, my girlfriend Mariette Ruys and her daughter Roelien, Ruben van Leer and his girlfriend Nadia, we travelled to Morocco as volunteers to help during this festival. For the first time I was interviewed by several local and international journalists and TV crews were present to report on this festival. They were also present during the tree planting action on the second day of this festival took place. At the end of each day there was music made by national and international musicians, with the Sahara as their shared background. The highlight was the presence of world famous group from Mali: Tinariwen. What a unique experience! Mariette, what a special journey, many thanks to you for all your support then and now! See the above short documentary about this festival by my son Laurens Hebly and his friend/college Ruben van Leer. Up till January 2016 there have been six Taragalte Festivals each with it’s own theme. A Sahara-Roots team has been fortunate to have been able to attend five of these festivals in which we were able to participate in different environmental activities as well as developing a documentary on the 1st Taragalte festival.